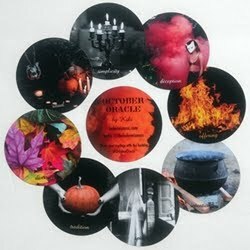 Ancient Animal Wisdom is an oracle deck that connects you with the energies and messages of African animal spirit guides. The artwork is by Jada Fire, and the guidebook is written by Stacy James and Jada Fire, published by US Games Systems, Inc. There are 38 cards in this deck, measuring 3.5" x just over 4 3/4". They have a light glossy sheen. 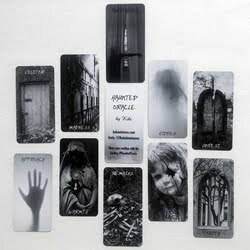 The cards are sturdy yet flexible enough to shuffle vertically or horizontally. This is nice, because I like to shuffle taller cards horizontally. The borders are different colors, and appear to be assigned randomly, as opposed to grouping similar animals in the same color borders. The back design is not reversible, although at the end of the booklet, there is a small section on using reversals with this deck. Each card has a number at the bottom and the animal's common name (sometimes at the top, sometimes at the bottom of the card). I would have thought that the title placement varying would be distracting, but I didn't even notice it until I sat down to write this review. But I did only pull one-card readings with this deck, so I can't say if I would find it distracting in a spread (though I really think it wouldn't bother me). The deck and book come housed in a nice sturdy box with a lift off lid. My one complaint about the box is that it doesn't have the half-circle cut outs on the sides for easy lifting. The deck consists of 35 animals, 2 trees, and 1 hybrid. The animals are varied, including land, water and air animals. There are insects, amphibians, reptiles, mammals and birds. There are the African animals you are familiar with (elephant, giraffe, lion, zebra, rhino) and some more obscure ones (kudu, civet, lilac-breasted roller), and then there are some that make me smile because they make me feel like I'm in the middle of The Lion King (warthog, wildebeest, hyena). No meerkat though. There are many animals in this deck that I never even knew lived in Africa, so going through the deck was a learning experience. One of my favorite cards is the Honey Badger. What a great inclusion! I absolutely love that it is shown in a fit of rage, in line with its reputation. It's an amazing card. The first word that came to mind when I saw it was "fierce", and when I looked up the card in the book, the keyword is "fierce"! So she really nailed that depiction in the image! My three other favorite cards, art-wise, are Dik Dik (so sweet and striking), Giraffe (so pretty) and Chameleon (so whimsical and unique). The hybrid card is titled Dugong Tiger. Oh... I so wish this had just been a Dugong card. My favorite animal is a manatee, and although a dugong isn't a manatee, it is the closest I have come in a deck. But alas, the Dugong Tiger image doesn't even show half a dugong! It is half tiger, half human. Why? I don't know. There is no mention in the book of why its title says Dugong, but the image is human. Even if it had depicted a dugong, I still don't understand the choice behind the dichotomy of these two particular animals. The card is about the balancing of extremes. While I can see some opposites in the two animals, I would've liked to have read a little about the animals and why they were chosen. And why it's a human on the card, with no dugong in sight. It is a confusing card on many levels. So I just look at it as balance or extreme opposites, and let the rest of it be a mystery. The two trees in the deck are the Baobab Tree and Sausage Fruit Tree. I love Baobab trees, so I was delighted to see this included. And I had never even heard of a Sausage Fruit tree before! They are both gorgeous cards. All of the cards are gorgeous! The artwork is whimsical and colorful, yet it does not feel childish. It is a mature whimsy. There is one card that stands out from the others. The Kite (shown below) is mostly black and white, with color only in its eyes, beak, and star design above the bird (and border). I find this very striking. There is something really special about this deck. There is an energy about it that is hard to describe. It feels different from other animal decks. 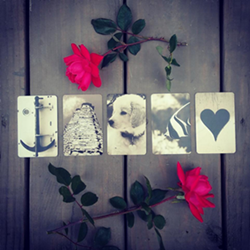 It is the combination of the artwork that I love, the way the deck speaks and the messages it gives. It has that special something that not every deck has. The first card I drew from this deck let me know we would be good friends. I drew the Black Mamba Snake. It felt very Scorpio-esque. The subtitle is Death of Old Ways. It reminds me of the Death card in tarot. From what I know, the Black Mamba snake is known to be the fastest and one of the most venomous and deadliest snakes. So the day I drew it, I knew that if there was change to be had, it would be better to get to it proactively and on my own terms rather than waiting for it to strike and bite me hard and fast! Not to wait until it became painful. Then I spent a week with the deck, drawing a card each morning. My week started with Warthog (Pumba!) who told me that it's what's inside that matters. Next was the Nile Crocodile, reminding me to pay attention to my awareness. The Gorilla reminded me to love. The Baobab Tree thanked me for my offering (I literally donated the day before!). The Gazelle advised me to release what was impeding my natural flow. The sacred spiral mentioned in the book also had relevance in my day. The Baboon reminded me to connect with my primal spirit on a day that I was actually feeling very primal/tribal! The Owl appeared to talk to me about my inner shaman. The cards that appeared for me in my daily draws walked with me to show me how this deck is best used. None of the cards were divinatory in message. They were conversational and thought provoking. They would give me a spiritual area to focus on that day. They let me know where my energy would best be focused. These animals weren't here to tell me what to do, or what was going to happen to me. They were guides. They told me how I could be my best self that day. How I could use my energy for my highest good. Where I could be of service to others. Where I would benefit from stepping into my own power. What a beautiful idea! It is really a very empowering deck. The book is 48 pages and is the same size as the cards, so they fit nicely in the box together. The cover is glossy on thick card stock and it has binding, so it is a sturdy little thing. The book begins with a title page, copyright page and Acknowledgments page. There are a few pages on general reading information. I am confused about the inclusion of numerology in the booklet. 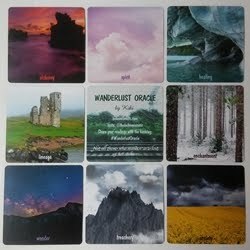 The booklet's subtitle is "Messages, Meanings & Numerology". There are numerology meanings given for numbers 1-9, one one single page. I'm not sure why this is included, as it seems to have no bearing on the card meanings. The passage suggests that you do research into your own personal numerology, and to pay attention to the numbers you attract, as they might hold meaning for you. Again, I don't know what this has to do with the cards. There is one other reference I saw to numerology in the book, in one of the spreads, but it had nothing to do with the cards themselves. There is no reference to anything like maybe adding up the numbers on the cards until you receive a single digit number, then looking up the meaning of that number. So I didn't do this, and don't plan to. For me, this was a puzzling, irrelevant and superfluous page in the book. There is a page explaining the local Zambian language of Nyanja, and how in each card description, the animal names are also given in the local language. Most of the animals are found in Zambia, but for those found in another region of Africa, the closest local language was used for the translation. Pages 8-10 feature the Table of Contents (which I would have put at the front of the booklet for easier finding), with a list of the cards first and then the spreads. The cards are listed in order of card number. It would have been easier to find the cards if they were listed in alphabetical order. When you look at a card, you remember it's a Giraffe. You have to take extra time to find that it's number 5. Next is the section with the card meanings. There is a paragraph dedicated to each animal. Each meaning begins with the animal's name, both in English and translated in its local language. Then a keyword is given. Beneath that is the meaning. No reversed meanings are given. Some of the meanings incorporate a little of the animal's physical traits or characteristic behaviors. I find myself connecting better with the cards that do this, because I can understand why their meanings were chosen. I wish every card included this connection. There is a page on shuffling and laying out cards and reading reversals. For reading with reversals, they suggest it means a resistance or imbalance with the card's energy, or "heading in the reversed direction". The book begins its end with a passage blessing Ted Andrews and the Medicine Cards creators, Jamie Sams and David Carson, for inspiring this deck. There are a couple of pages about the author and artist. The booklet ends with four lined pages for notes. 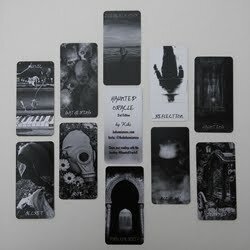 This is a very unique and beautiful deck providing spiritual wisdom. It's definitely the prettiest animal deck I've seen. While there are a few things I would have changed about the book, the passages offer empowering and beautiful ideas to incorporate in your daily life. It's a wonderful deck to use as a spiritual guide. All the cards I drew were inspiring and motivational. I can see all of these animal spirits becoming old friends as you get to know each and every one of them. It's a deck that I can see people easily connecting to. I love using this deck - it feels very special. 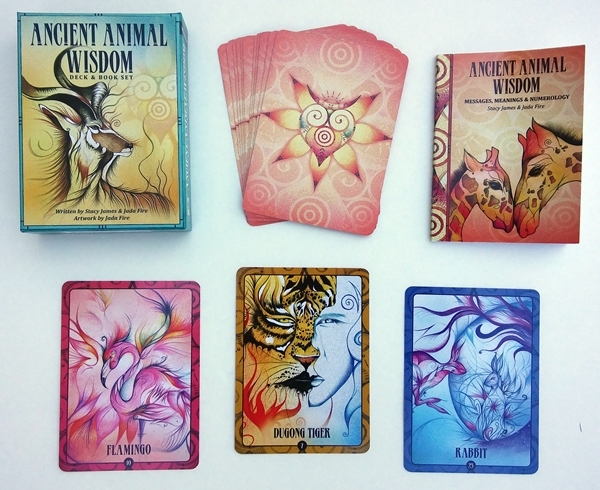 Deck: Ancient Animal Wisdom, written by Stacy James and Jada Fire, illustrated by Jada Fire. Published by US Games Systems, Inc.